Of all the ice-cream toppings, I have to confess I like Hot Fudge the best. Nothing else really compares. Caramel is good, Salted Caramel is fantastic and Butterscotch, what can I say? I wouldn’t turn any of them down but Hot Fudge Sauce? That I would seek out! I mean hot fudge is so seriously amazing. I love how it goes on all warm and liquidy and then hits that ice-cold ice-cream and thickens up into a gooey candy like substance, don’t you? When I was young, my Mom taught me how to make Hot Fudge – she called hers “Heavenly Hot Fudge” and it must have been a thing because I found the same recipe in my Grandma’s recipe box. This recipe is super quick and super easy and uses only ingredients I happened to have on hand. I just used chocolate chips for the chocolate, but you can use just about any kind of chocolate you like. I mean, really, how could you go wrong? I always try to stock up on chocolate around holidays, especially after Valentine’s or Easter for good eating quality chocolate and the winter holidays for baking chocolate and other baking items. Use coupons when available. And only stock up if you have willpower! I had a heck of a time getting pictures of the Hot Fudge Sauce – and had to eat – I mean sacrifice – more than a spoonful of the stuff. Finally, I decided if I froze the ice-cream in the cups it might work better, but then I got condensation so that’s what’s going on there. In medium saucepan, stir all ingredients (except vanilla) together over medium low heat until combined and melted. Increase heat to medium and bring to a low boil, stirring frequently. Continue to cook for 3 minutes, stirring frequently. Stir in vanilla off-heat. Cool slightly (to about 140°F) before serving. Reheat in microwave in 30 second intervals, stirring after each. This entry was posted in Click here for Fabulous Food Posts and tagged Chocolate, Chocolate Chips, Dessert Sauces, Desserts, Frugal Hausfrau, ice. Bookmark the permalink. Yum! 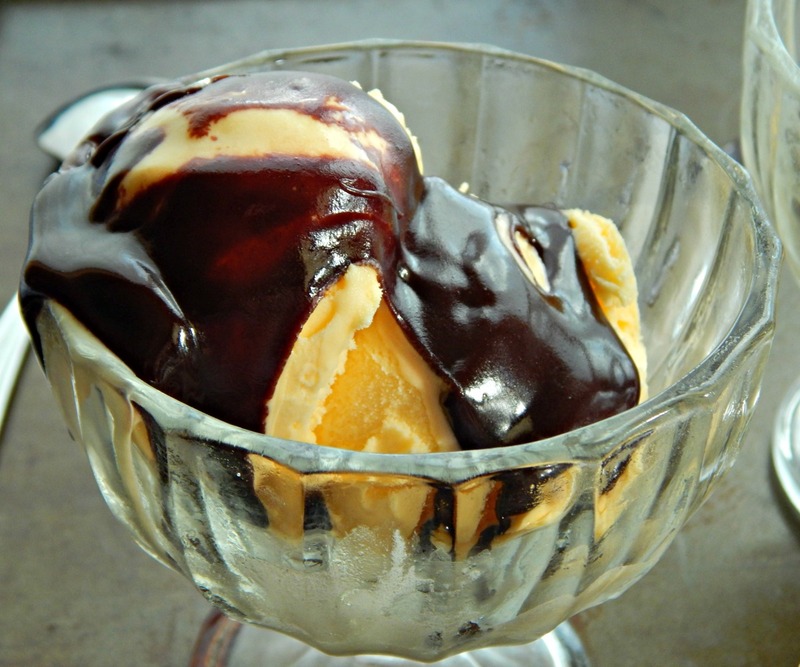 Can’t go wrong with hot fudge on vanilla ice cream! Or peanut butter ice cream… or strawberry ice cream… I might just eat this straight out of a bowl with a spoon! Yum! Happy FF! lol, Ai! I’m right there with you! And thanks for hosting FF for us! Just right on time – I was just looking for a perfect fudge recipe and this looks perfect to me! Thanks for sharing at Fiesta Friday party, Mollie! I know, right!! I love making chocolate syrup, too, though…so much better than store bought! I love this sauce because although it is chocolate it seems pretty ‘light’, no heavy cream so it’s ok to have seconds, right? lol, Monika! I guess I’d have to run the number, but then I really don’t want to, if you know what I mean! I love that it has some real chocolate in it! This is a delightful recipe! Yumm! Thanks for sharing this! Another one for my folder! Wow, I can’t tell you how good that looks. My husband would go mad for this sauce. Your desserts are so fabulous, Mollie! Looks delicious! I never thought to make this from scratch. I know I had plenty of ice cream when I was pregnant. Lol! When I was pregnant I craved fudgesicles of all things! It’ so much better home0made. The sauce never seems quite as smooth as the jarred but the taste is a thousand times better! This is some seriously good sauce Mollie. I will be trying it…. thanks for the lovely share! My pleasure, Zeba! I hope you like it as much as we do! One of my favourite sauces. I’ve never made butterscotch though. I’ll have to give it a try. I’m going to have to use unsalted butter though cause my only other option is margarine. lol and thanks! I love your little strawberry! So darling! Thanks Henrietta! I appreciate it!